Green New Deal | What Did You Say? The Senate voted on Tuesday on freshman Democrat Rep. Alexandria Ocasio-Cortez’s “Green New Deal,” an ambitious project that would cost upwards of $100 trillion taxpayer dollars. 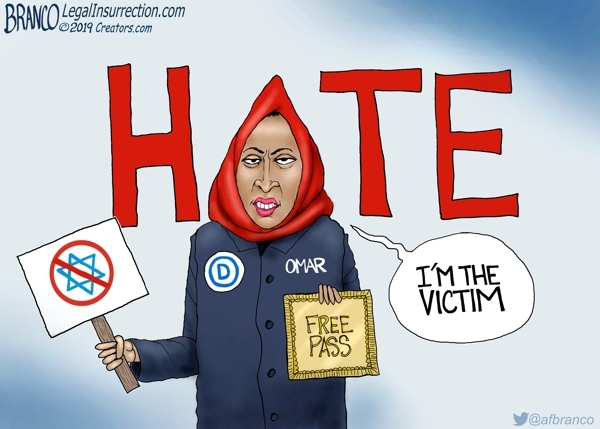 Things didn’t work out in AOC’s favor – not by a long shot. A new report suggests the real number could nearly hit $100 trillion. That would come to, roughly, $650,000 per American household. Socialist Rep. Alexandria Ocasio-Cortez’s (D-NY) “Green New Deal” — a massive government takeover of large portions of the U.S. economy — is projected to cost up to $93 trillion. Ocasio-Cortez is “the boss.” Everybody good with that? 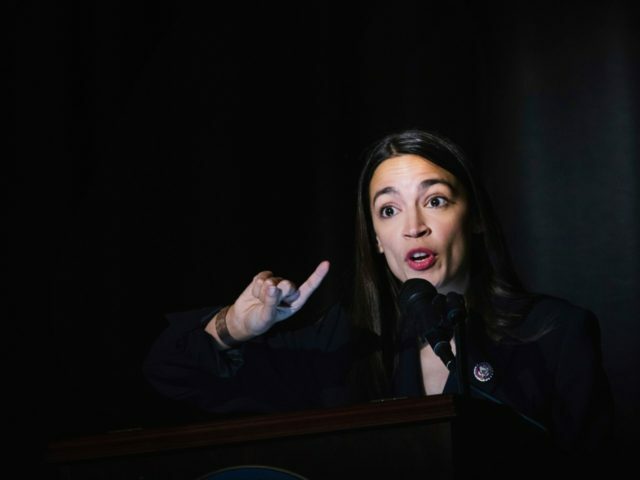 When Democratic New York Rep. Alexandria Ocasio-Cortez first introduced the costly socialist power grab known as the Green New Deal — with a matching resolution in the Senate by Democratic Massachusetts Sen. Ed Markey — it was widely criticized and mocked as absurd and unconstitutional by the right. Even some on the left expressed misgivings about the proposal to fundamentally transform the entirety of the United States’ energy sector, economy and much of society in general, ostensibly to combat climate change but in reality to centralize more power and control with the federal government. Now the Democrats who support the measure put forward by Ocasio-Cortez are facing an incredible predicament as a major force for fundraising and voter support on the left — organized labor unions, especially the American Federation of Labor and Congress of Industrial Organizations, or AFL-CIO — have come out firmly against the Green New Deal. 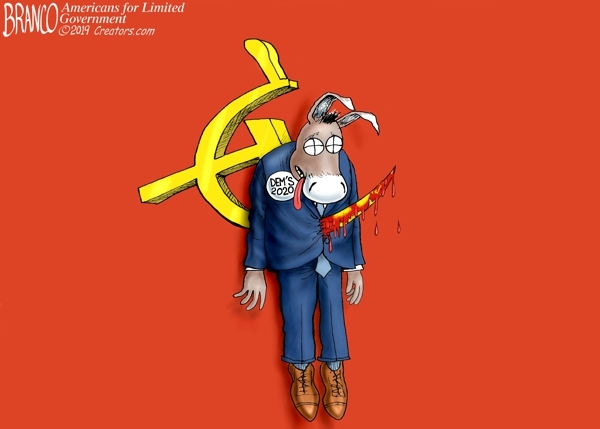 That will force some Democrats to choose between placating their typically moderate liberal union worker voters or appeasing the increasingly rabid and radical far-left base of the party that demands significant action on environmental concerns. Republican Wyoming Sen. John Barrasso tweeted out a copy of a letter sent from leaders of the AFL-CIO labor union conglomerate to Markey and Ocasio-Cortez,. It expressed how the labor unions simply couldn’t support the Green New Deal proposal that would “cause immediate harm to millions of our members and their families,” a message with which the Republican senator agreed. The letter, dated March 8, began by noting that union workers weren’t consulted on the ideas put forward in the proposal, even as those workers stood most at risk of facing severe economic disruptions and potential job loss because of the proposed policies. The unions agreed that some action was required to address the eventual impact of man-made climate change, and even expressed support for investment in new technologies to produce clean and carbon-free energy. However, they seemed to balk at some of the proposals — such aiming to do away with the current national dependence on fossil fuels like oil and natural gas within 10 years — as being non-specific and threatening toward the survival of their jobs and various sectors of the industrial economy. The letter closed by reiterating that something needed to be done, but suggested that discussions be held about “responsible” solutions that would not utterly destroy the energy and industrial sectors of the economy and the livelihoods of those who work in those and related areas. The letter was signed by Cecil Roberts, international president of the United Mine Workers of America, and Lonnie Stephenson, international president of the International Brotherhood of Electrical Workers, as well as eight other major labor unions under the AFL-CIO banner. The Washington Post reported that the criticisms in the letter seemed to echo comments made to the media just days prior by AFL-CIO President Richard Trumka while he was on Capitol Hill to speak with lawmakers. Trumka said, “Look, we need to address the environment. We need to do it quickly. But we need to do it in a way that doesn’t put these communities behind, and leave segments of the economy behind. “So we’ll be working to make sure that we do two things: that by fixing one thing we don’t create a problem somewhere else,” he added. Labor unions have long been relied upon by the Democratic Party for considerable support in elections, but that support has been wavering in recent years, given the increasingly leftward lurch of the party’s base and elected officials who stand fundamentally at odds with the more moderate and conservative-leaning rank-and-file workers who make up private-sector unions. President Donald Trump siphoned off quite a few of those typically Democrat-voting union workers in the 2016 election. If Democrats continue to press forward with their proposal to wreck the economy and energy/industrial sectors as we currently know them, that problematic trend for Democrats will likely continue and grow devastatingly larger in the 2020 election. 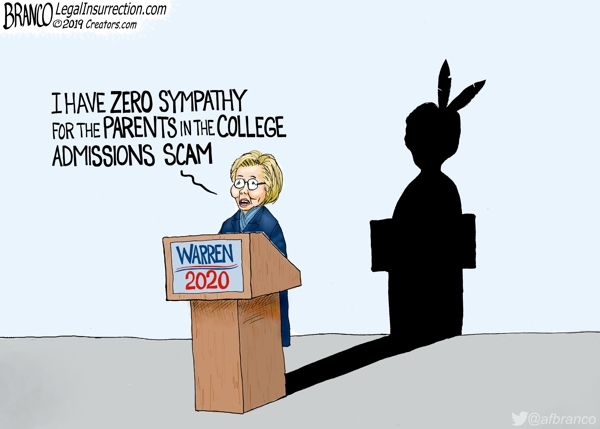 Elizabeth Warren says she has zero sympathy for the parents involved in the admissions scandal but wait, how did she get into Harvard? Environmental activist Michael Shellenberger explained to Fox News host Tucker Carlson that it’s not possible to shift the country’s grid completely to renewable energy. Shellenberger laid out the two main problems that plague wind turbines and solar panels: unreliability and low energy density. Because solar and wind produce such small amounts of energy, according to Shellenberger, they require a much larger amount of land to generate electricity. Instead, the Environmental Progress founder touted the benefits of nuclear energy — a source of power that can generate large amounts of reliable energy while emitting zero carbon emissions. However, Shellenberger said the public has yet to fully embrace nuclear energy because they associate it with nuclear bombs, past nuclear accidents and a desire to use energy that harmonizes with the natural world. “That turns out to be a bad idea because the more natural resources we use, the worse it is for the natural environment,” he said. As environmental activists become more alarmed about the threat of climate change, many are reevaluating how they perceive nuclear. The U.S. nuclear industry currently supplies about 20 percent of the country’s total electricity, but it provides roughly 60 percent of its zero-carbon electricity. A growing number of climate change-oriented lawmakers are now passing subsidies and support programs to keep nuclear plants in operation. Shellenberger went on to say it was “very disappointing” that Alexandria Ocasio-Cortez’s widely publicized Green New Deal does not include provisions for nuclear energy. Ocasio-Cortez’s original FAQ document on the Green New Deal, in fact, called for a phase out of nuclear power. However, following the botched roll out of the Green New Deal, her team took the anti-nuclear language off their website. 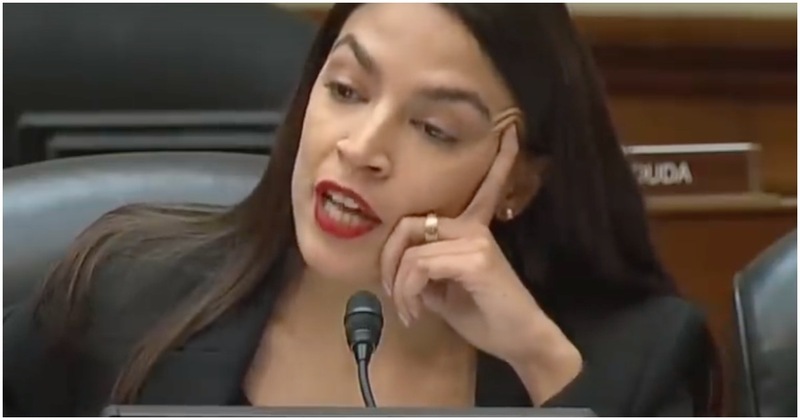 In the context of the “Green New Deal” Alexandria Ocasio-Cortez asks the question is it okay to still have children? in other words, stop having children. URL of the original posting site: https://www.breitbart.com/politics/2019/02/25/nolte-luddite-ocasio-cortez-says-we-all-need-to-stop-reproducing/? 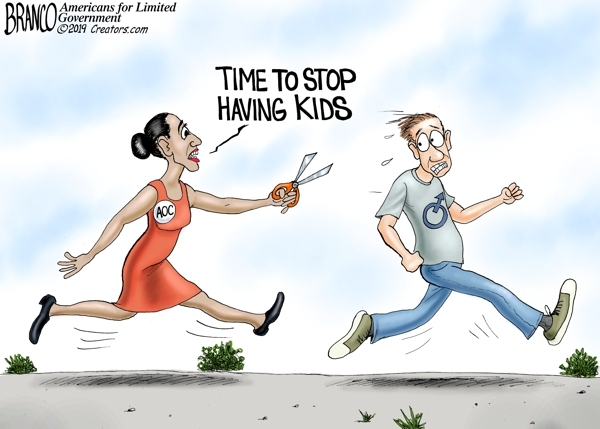 Rep. Alexandria Ocasio-Cortez (D-NY) took her climate alarmism to a whole new level Sunday when she said we should stop having children. Using Instagram, America’s socialist “It Girl” filmed herself cutting up some food while she spread wild-eyed conspiracy theories about life as we know it ceasing in 12 years — a false claim she has made in the past. On the issue of having children, she suggested it would be irresponsible to sentence young people to the holy environmental hell that is sure to come — unless, of course, we sign on to her Green New Deal, which would require us to slaughter all the cattle (to stop their deadly farts), end air travel, eliminate automobiles, turn our freedoms over to educated-but-dumb central planners like Ocasio-Cortez, and agree to return to the Dark Ages, a world where hot water heaters, TVs, and automobiles will be useless on a cloudy day. What planet is she living on? Our air has never been cleaner, our water has never been clearer, there are more trees in America today than there were a hundred years ago, the crying Indian solved our litter problem, we are living longer and healthier lives, and we continue to find an abundance of natural resources, including natural gas and oil. As a child of the ’70s, I marvel at the difference between now and then, and what got us here are the kind of technical innovations that can only come from a capitalistic society and the American people voting for common sense laws about protecting our water and air. Ocasio-Cortez is a hysterical, power-mad luddite, a charismatic grifter desperate to undermine all the technological progress of the last hundred years. Our species has already tried to live off of green power, to live off the whims of the water, land, sun, fire, and wind… It sucked. If you want to know what life looks like under Ocasio-Cortez’s Green New Deal, watch HBO’s Deadwood. And you can bet that while we are all living in massive government housing projects taking cold showers and eating seaweed burgers, Ocasio-Cortez and her ilk will be living like Stalin in a dacha by the sea. 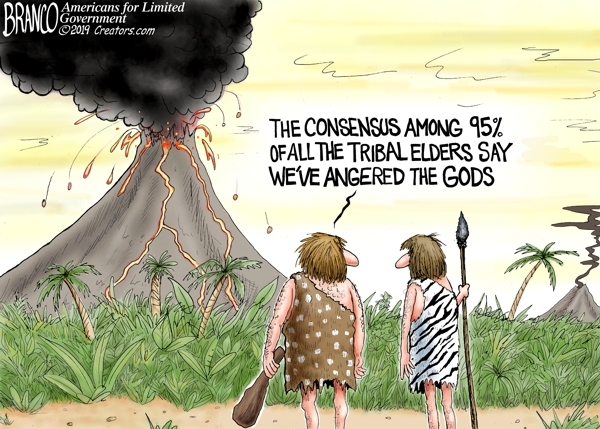 For decades we have suffered with the threat of these climate hucksters, these fanatics who tell us the end is nigh unless we give up everything that makes life worth living, including our freedoms. Another Ice Age is coming. Overpopulation would mean worldwide starvation. The oceans will be dead by 1995. The ozone layer will disappear. Super hurricanes would wipe out our East Coast. New York would be underwater by now. We would run out of oil by 1999. Seal levels would rise 20 feet by now. The ocean conveyor would shut down. Polar bears would be extinct. The Arctic Ocean would be ice free by now. …and it was all lies. Oh, and as I speak, our planet is cooling — not a crazy kind of cooling, but enough to prove that this living organism we live on runs through various cycles and could care less if we drive a Prius or Hummer. Ocasio-Cortez is young and attractive and talks like a harmless Disney character, but she is crazed for power and telling audacious lies in pursuit of it.